As you may know, each of us will choose a "word of the year" at the January meeting to quilt in the medium of our choice. We recommend that you bring sketching paper, drawing materials, and a 2019 calendar to the meeting. The directions below give an idea of the scope of the project. To help you consider some different lettering options...Nancy and Diane will share some examples and these sites might be useful too. Extras you might find helpful. As 2018 draws to a close, it's an excellent time to look ahead to 2019 and reflect on our hopes and aspirations. At our January meeting we are asking each of you to select your "word of the year” -- nothing fancy or hard to remember, but a word that has personal meaning to you or expresses a theme for the Guild in the upcoming year. 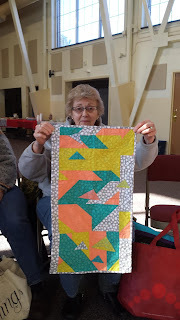 We will be working toward quilting that in the medium you desire, so bring your sketchbooks and drawing materials. Members will also have the opportunity to vote on the programs that will be the focus of our creativity during our meetings in 2019. The meeting will be held on Saturday, January 5, from 10 a.m. to noon at the Wiggin Memorial Library in Stratham, N.H. Please note that 2019 dues are due. Payments can be mailed to the Guild's P.O. Box at the address below, submitted via PayPal, or brought to the January meeting. The Seacoast Modern Quilt Guild (SMQG) met at the Annex in West Newbury, Massachusetts on Saturday, December 1st from 10:00 am - 12 noon. Judy opened the meeting, welcoming 16 guild members in attendance. A short business meeting preceded the end-of-year party fun. As announced at the November meeting, a change to the guild bylaws was needed in order to accommodate the change of the guild location and mailing address. The change involved only the first paragraph of “Article I – Name, Location & Tax Exempt Status”. It changes the location from “West Newbury, Massachusetts” to “Newburyport, Massachusetts” and the mailing address from “PO Box 774, West Newbury, MA 01985” to “Unit #1606, 61 Pleasant St, Newburyport, MA 01950”. There was unanimous agreement to accept this change. JoAnne again made available pricing for the 2019 retreat to be held in May and announced that she would hold a brief meeting of those interested in joining the retreat committee immediately following the December meeting. Judy provided follow up on the 2019 Quilt Con charity quilt. 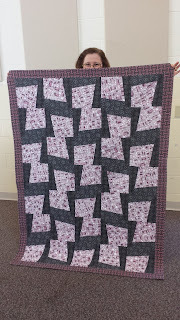 Andrea had completed the binding and attached a sleeve to the quilt which she displayed to the delight of all, especially when it was noticed that tiny piecing had been incorporated into the binding!. Thank you, Andrea! Kate has offered to machine embroider a label for the quilt as soon as we have the MQG guidance on what it should say. 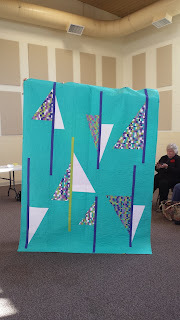 It was discussed that a second label could be prepared to swap off once the quilt returns from 2019 QuiltCon and before it is donated. 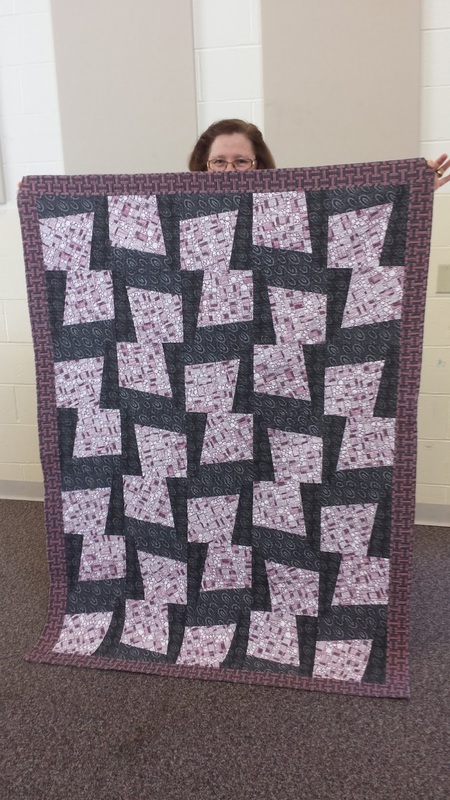 The organization that will receive this year's QC charity quilt is the Teen Pregnancy and Parenting Program in Newburyport, MA, which is part of the Department of Children and Families' DARE program. Our thanks to JoAnne for reaching out and providing contact with DCF. Judy also noted 3 other Massachusetts charitable organizations that she has identified for potential future donations. These include Lucy's Love Bus in Amesbury, Hospice Care of Haverhill, and Pelican Intervention Fund, serving the greater Newburyport area. Discussion of potential new policies remains tabled until 2019. Six lucky winners were selected for door prizes. Pillow cases were collected from those who had completed them since the November meeting. 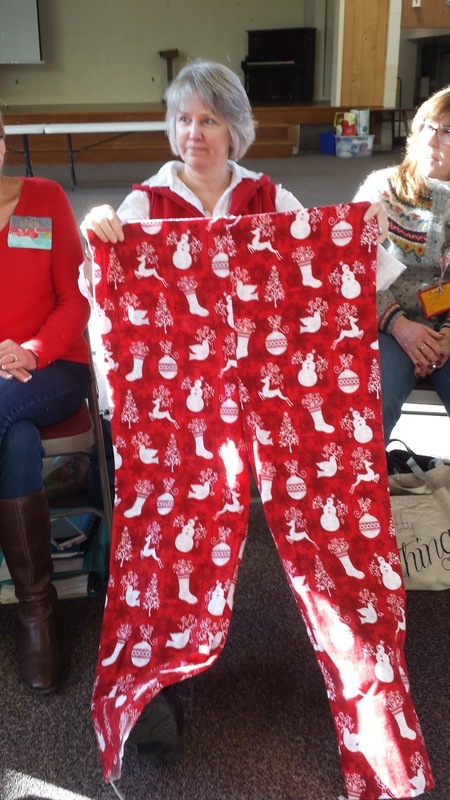 Barb didn't have the exact count but estimated at least 175 pillowcases have been contributed, far exceeding the goal of154. A very successful effort! Thanks to all who contributed! Catherine will deliver them to the Tewksbury hospital for those in the residential program. Show and Tell came next. 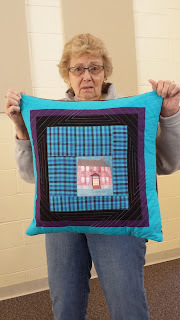 Paula shared her finished project for the MQG Michael Miller Challenge as well as a pillow she made using the printed image of her house block from the Strawberry Banke quilt that Diane gave her. Diane also gave her the fabric she used to back the pillow. There was some discussion of whether or not this pillow should belong to Diane! 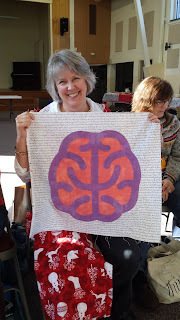 Nancy is making matching flannel pajama pants for the whole family and a “brain” needle turned appliqued pillow for her daughter. She is hoping that image of braininess has a positive effect! Everyone agreed that Kelly's sister will love this “Big Foot” quilt that Kelly has made for her and the wood grain quilting Kelly did on her home machine was much admired. 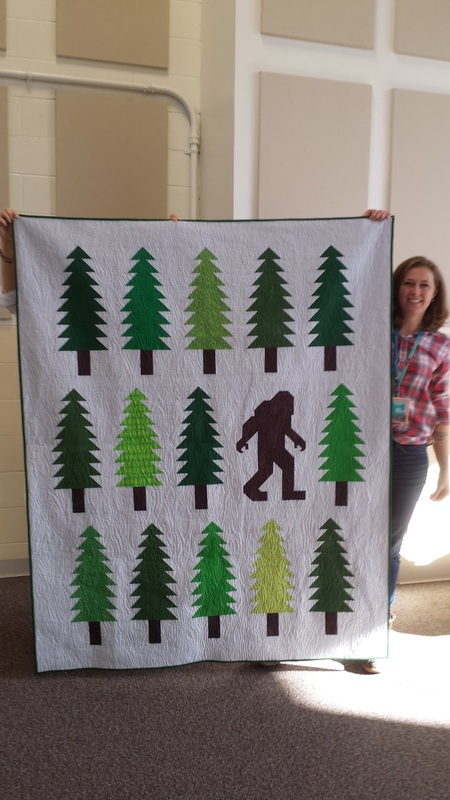 Kate used self-designed fabric that she had printed through Spoonflower for her QuiltCon entry, which she finished in a very short time! We all enjoyed the wonderful array of food items that everyone had brought before our Yankee Swap and a game of Left-Right-Center, which Barb won. Incoming and out-going board members met for a transitional meeting following the fun. Stay tuned to hear from them concerning the meeting plans for January.